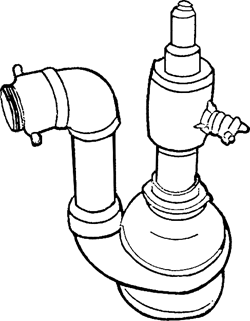 A small, single-stage vertical pump used to drain shallow pits or sumps. A pump used to remove the accumulated waste in a sump. Therefore, if the motor to the sump pump quits working and water is then discharged through the basement, the cleanup of the water is covered, but the cost to repair the pump is not. 8220;During this time of year, when we see a winter's worth of snow suddenly melting, sump pumps can be forced to work overtime, and if not properly working, can cause flooded basements and damaged property,” says Ryan Gumieny, Vice President of Flat Rate Home Services in New Berlin. Too often, homeowners don't discover a sump pump failure until they see the damage. Can you count on your sump pump? After a trip to the store for pipe and elbows and sleeves ($57), we jury-rigged a temporary sump pump line, at one point splinting two sections of pipe together with a cross-country ski pole and duct tape. CUTLINE: (1) Everett Carlson jack-hammers a concrete floor where a sump pump will be installed. Turn the sump pump back on and allow the tank to drain. Since it had been raining for quite some time when the call from McFadden came, the sand bags and the sump pump had to be put back in place. PHILADELPHIA -- Considering the severe storms that struck in March through May last year in many parts of the country, ACE Private Risk Services, the ACE Group's high-net-worth personal lines insurance business, encourages consumers to better protect their homes from basement flooding by installing a properly sized sump pump with a backup battery power supply. I was tired of my sump pump pumping all of its water into our yard and leaving it a swampy mess. The Basement Doctor, Ohio's 23 year expert contractor for wet basement waterproofing, has now expanded its service territory and provides award winning, warranted damp and wet basement waterproofing and sump pump services to the northeast Ohio area. This includes water damage from a sewer or drain backup, such as an overflow from a sump pump. Last year, Thousand Oaks was unable to host a meet and water had to be drained off the track with a sump pump.